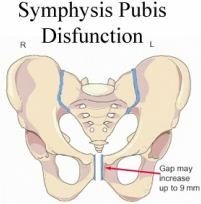 Symphysis Pubis Dysfunction, also known as SPD, is a common health condition that causes extreme pain in the hips, back, groin and legs of pregnant women. This painful pregnancy symptom is a result of the aptly named hormone Relaxin. Relaxin helps to naturally make ligaments relaxed and stretchy in order for the baby to ease its way into the world. Many times, relaxin does its job too well, causing the pelvic ligaments to become too loose too soon. 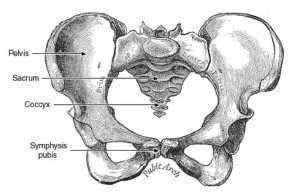 As a result,the pelvic joint becomes unstable, causing moderate to severe pain and instability. As many as 1 in 3 pregnant women may have this condition to some degree, and may not even recognize it as a condition all its own. More often than not, it is overlooked, as women do their best to endure it as another major discomfort of pregnancy. Pelvic girdle pain can be anything from a minor ache to a searing sensation that wraps around the back and travels down below the belly. Most women will experience this at some point or another during their pregnancy. As the ever-expanding tummy puts ever-increasing stress on the bones, joints, and muscles in the pelvis-the pain can hit at almost any point in the pregnancy, and the impact can range from minor aches and pains to debilitating and unbearable misery. Severe pain that tends to get worse when you lift your legs for getting into bed or car. Difficulty to move the lower part of your body when you wake up in the morning. Pain that gets worse when you lie on your back. Reduced range of movement of the hip bones, causing difficulty walking. Pain shooting down your buttocks and legs (sciatica). A clicking sound near the pelvic area while in motion. If you think you may be suffering from this condition, do some research and talk to your doctor. Never just endure the pain. Many things can be done to help lessen the symptoms of SPD. Acupuncture is an increasingly popular way to alleviate all kinds of pregnancy ills, including pelvic girdle pain. Your doctor will almost always instruct you to purchase (and wear) a pelvic support girdle, aka a maternity belt with a special pelvic support built into it. While there are alternatives (albeit none that really measure up in terms of effectiveness, appearance or even cost), the increasingly popular choice for dealing with moderate-to-severe pain of this nature is a product known as a V2 Supporter, or a variation thereof. The V2 Supporter is sold as a standalone compressive therapeutic undergarment, and can also be purchased as a 2-in-1 combo support undergarment such as the Prenatal Cradle Plus V2 Support and the Hip Brace Plus V2 Supporter. This undergarment will provide much needed support for your belly (and relief for your pelvis). These same products are also used to treat a very common condition during pregnancy called vulvar varicosities, which is effectively vulvar or vaginal varicose veins. While more common among women who are pregnant, many women who are not pregnant and some who’ve never even been pregnant occasionally come down with this most unfortunate condition characterized by painful swelling of the vulvar region. Back to Symphysis Pubis Dysfunction, heating pads and ice have been known to offer significant relief. Choose the right sleeping position — lie on your side with a pillow between your knees to keep hips aligned. Do what works best for you and your body. Try doing KEGEL Exercises. Yes, our old friend can do wonders in this situation. These handy little workouts strengthen the entire pelvic floor, the muscle that stretches like a hammock across our abdomens and essentially holds all our organs up. The stronger it is, the better it holds up the growing baby and uterus and the less everything presses on those already weakened bones. If the pain is severe, ask your practitioner about pregnancy-safe pain relievers (never take any medications unless specifically okayed by your practitioner). Remember, do what makes you comfortable and what makes you feel better. Work together along with your doctor and family to make this special experience as comfortable and enjoyable as possible. More tactics to try: Sit down to get dressed, and avoid heavy lifting and pushing (which you should be doing anyway). Do your best to stay off your feet and try to be patient until the baby comes. For most moms, once the baby is born and relaxin production ceases, your ligaments (and your dance moves) will return to normal in no time. The National Center for Chronic Disease Prevention and Health Promotion reports that 46 million Americans have been diagnosed with arthritis or other rheumatic conditions. In addition, arthritis is the most common cause of disability in the US, limiting activities of daily living of an estimated 19 million adults. A new CDC report published April 29, 2011 in the edition of Morbidity and Mortality Weekly Report raises new concerns about arthritis and its link to obesity. As obesity increases, people diagnosed with arthritis increases. And the rates are increasing faster in some states. The more weight people gain the higher their risk of developing arthritis. Researchers have been tracking health-related conditions and behaviors for more than 15 years. The data was broken down state by state. The states with the highest obesity rates were: South Carolina, Arkansas, Kentucky, Alaska, Michigan, Missouri, West Virginia, Wisconsin, Mississippi, and my home state of Louisiana which has the nation’s highest percentage of obese residents at 43.5%. Osteoarthritis is also called degenerative joint disease. It is the most common type of arthritis. It is a chronic condition characterized by the breakdown of the joint’s cartilage. The breakdown of cartilage causes the bones to rub against each other, causing stiffness, pain and loss of movement in the joint. Osteoarthritis is common in all races and backgrounds. It usually appears after age 45. Overall, more women have osteoarthritis than men. There is no cure. Many factors may play a role in whether or not you get OA including genetics, age, obesity, injuries such as sports injuries, muscle weakness, free radical damage and oxidative stress, lack of fruits and vitamin C.
Healthy lifestyle modifications are important for people who suffer from arthritis. Weight management, a nutritionally balanced diet and exercise can help to reduce symptoms of arthritis. Fish Oil is an essential fatty acid that helps to ease the pain. Glucosamine helps to lubricate joints thereby reducing the pain of arthritis. Antioxidants are also beneficial to reverse free radical damage and oxidative stress. When natural remedies fail aspirin and NSAID’s (non-steroidal anti-inflammatory drugs) can be added. There are also products that can help relieve pain associated with some types of arthritis. For example, Egan Medical offers a variety of products such as these arthritis gloves, which help to relieve pain associated with arthritis of the fingers and hands. Egan Medical offers a variety of orthopedic braces and supports designed to help relieve arthritis pain. In addition to the various soft orthopedic goods, Egan Medical also offers Biofreeze, a pain relieving cryotherapy gel designed to among other things, help relieve pain associated with arthritis. To summarize, osteoarthritis cases are on the rise, and new research seems to indicate that this may be tied to a rise in obesity rates, which have been linked to osteoarthritis pain. Weight management through diet, exercise and general lifestyle changes is the best way to go about addressing the issue. That said, for those who are still in pain or who wish to minimize the pain while addressing the various lifestyle components of obesity and arthritis, there are products available that can help accomplish those ends. Now that summer is upon us and the weather is nicer, more people both young and old participate in outdoor activities. As you know exercise is good for your heart and overall health in general. Aerobic activities such as walking, running, hiking, riding bikes, playing tennis, racket ball, baseball, softball, volleyball, football, swimming, etc. are recommended to stay healthy. But then there are always those unexpected injuries that present at the most inopportune times. Having sustained a knee injury following a fall while running, I’ve suffered an impaired quality of life and inability to run due to chronic knee pain. I am finally considering laparoscopy to have the torn cartilage removed. Apply ice immediately after a common sports injury. It’s an anti-inflammatory, without many side effects. Use ice for 20 minutes every one to two hours for the first 48 hours after the injury. Don’t use heat during this time — it encourages swelling and inflammation. Strains and Sprains are the most common sports injuries. Sprains are injuries to ligaments, the tough bands connecting bones in a joint. Suddenly stretching ligaments past their limits deforms or tears them. Strains are injuries to muscle fibers or tendons, which anchor muscles to bones. Strains are called “pulled muscles” for a reason: Over-stretching or overusing a muscle causes tears in the muscle fibers or tendons. Ligaments and muscle-tendon units are like springs. The tissue lengthens with stress and returns to its normal length, unless it is pulled too far out of its normal range. Sometimes, common sports injuries are preventable. Some injuries we bring on ourselves because we’re not conditioned for the activity. Regular daily physical work outs can keep the body conditioned and strong to help prevent injury. Every workout should start with stretching and a gentle warm-up to prevent common sports injuries. Getting warmed up increases blood flow to the muscles, gets you more flexible, and could decrease injuries. Overuse injuries are common and preventable. Gradually start working out lightly before engaging in the activity full force. Stop when you are fatigued. Muscle fatigue increases your risk of all injuries. Usually, common sports injuries are mild or moderate — there’s some damage, but everything is still in place. You can treat them at home using the PRICE therapy method which will be discussed later. But you should expect that some common sports injuries may take months to heal, even with good treatment. If a sprain or strain is severe, however, the entire muscle, tendon, or ligament is torn away, and surgery may be needed. There are three stages of healing once you’ve incurred a sports injury. Stage 1: Inflammation (1 – 4 days) Pain, swelling & redness occur during this process where tissues lack blood flow and triggers the body’s immune response system to remove the damaged tissues. Stage 2: The Proliferative Phase (4 – 21 days), Oxygen and nutrient flow to the damaged area is restored allowing for repair of collagen. Scar tissue is formed. Stage 3: Remodeling Phase (21 days -2 years), scar tissue is degraded and type I collagen is laid down in its place restoring a more normal function. Swelling is a normal response to these injuries. Excessive swelling, though, can reduce range of motion and interfere with healing. The key is to limit swelling and start healing faster after common sports injuries. As an Anti-Aging Specialist, I would be remiss if I failed to mention recommended nutrients and dietary supplements as well as new procedures such as stem cells to aid in healing of sports injuries. The correct combination of nutrients, antioxidants, and dietary supplements can work in conjunction with the appropriate medical treatment to facilitate the healing process in less time. Omega 3 fatty acids act as anti-inflammatory agents. Fruits and vegetables contain nutrients, phytochemicals, and antioxidants that aid in the healing process. Herbs and spices such as turmeric, curcumin, bromelain, cinnamon, cloves, basil, thyme, oregano, cumin, chili powder, sage, ginger, parsley, and black pepper all act as anti-inflammatory agents. In addition to these, nutrients such as vitamin A, copper, zinc, and vitamin C fight inflammation, injury, infection and facilitate the healing process. While stem cell therapy is becoming more available in other parts of the world, it is only available in research here in the United States. Stem Cells are the repairmen of the body and have been used to treat non-healing bony fractures, herniated lumbar (lower back) disc, avascular necrosis (stages 1 – 4) of the shoulder, hip, knee, or ankle, osteoarthritis of the knee, hip, or ankle or degenerative joint disease, partial tear of the rotator cuff, other knee injuries such as a meniscus tear or tear of the ACL or MCL. Stem cells live inside all of us in various tissues, poised to leap into action to repair damage as it occurs. The problem is that as we age or get big injuries, we often can’t muster enough of these cells to the site to fully repair the area. Pamela Egan, MN, NP, ABAAHP Diplomat, CDE is a board certified Adult & Family Nurse Practitioner, a Fellow of the American Academy of Anti-Aging Health Practitioners, Certified Diabetes Educator, and Clinical Specialist in Gerontology/Mental Health. She can be reached at 985-892-3031 or www.pamelaegan.com.